I was promised at class last week that if I could come in this week with all of my bottom tier sets soldered together, I would be able to have my lamp mostly constructed by the end of class. As motivation, this promise is quite effective. I've realized I like lead projects better than copper foil, because there is so much tedious manual labor to be done on a foil project before you ever get to anything resembling construction. All that wrapping glass in sticky copper tape entails precisely none of the excitement of starting to put together a lead project. So I spent odds and ends of evening time foiling, all week long. I even recruited Don as a lackey---er, apprentice. He wants me to teach him how to build stained glass, too. And I will. Right up until he begins to show signs of being better at it than I am. 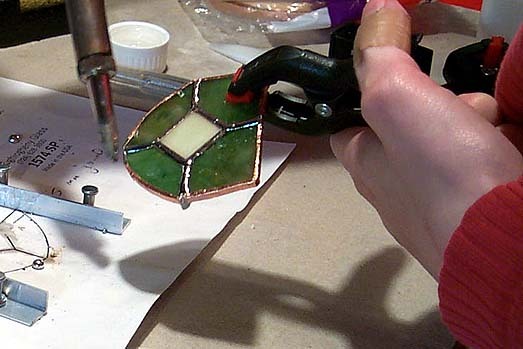 Today, foiling finished, I broke out the soldering iron. 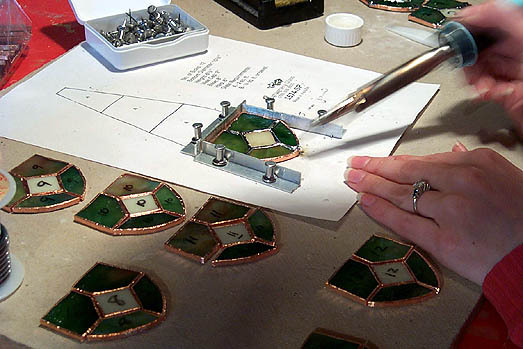 Only one of the four tiers or rings of my lamp design is made up of more than one piece of glass---that's the bottom tier, five pieces of glass on each of twelve sides. I started today working with sixty bits of lamp and ended up with a dozen larger bits of lamp. I realized, far too late for a fix, that the jig against which I was sizing all the pieces for this bottom tier was set up a little bit cockeyed. Which means that all my five-piece soldered sets from today came out a little bit cockeyed. I won't tell if you don't. I also made excellent use today of a recent Home Depot impulse buy. Next to the display of C-clamps in every size imaginable, I found these little plastic pincer-type clamps, 3 or 4 inches long, sold in sets of four: the perfect implement for holding glass while doing edge work with the soldering iron. The glass can become very hot, so a grabbing implement is an awfully nice thing to have handy. Although such an implement is still insufficient to save me from myself, given my foolish habit of burning my fingertips by flicking away errant balls of not-actually-cooled-yet solder. All in all, I'm not one hundred percent happy with my crookedy soldered sets, but it'll have to do. As always, gnarly mistakes are inevitable and even necessary for the perfection of any skill. If I can come home from class tomorrow night with an object recognizable as a lampshade-in-progress, it will have all been worth it. Crooked? No way. Those panels are really neat. Oh yes. It's very slight but definitely there. I've been kicking myself over it for three days!